That's it from here folks! Stay tuned to Sportskeeda for all the live updates from the 2018 Asian Games! 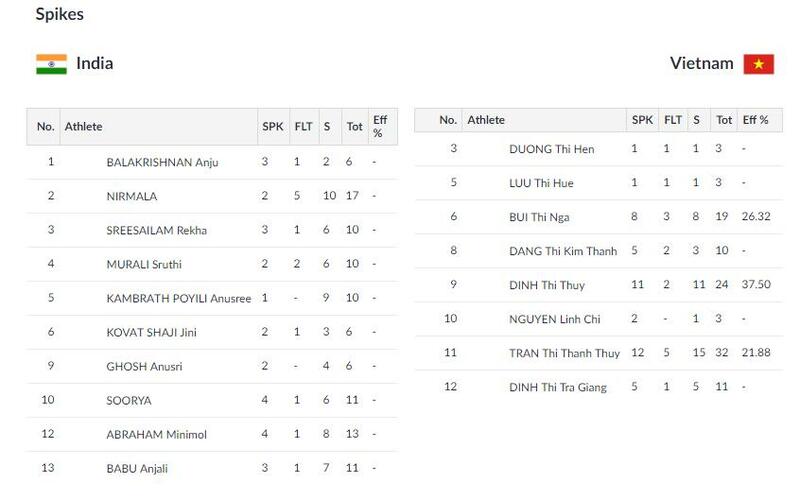 Vietnam beat India 25-18, 25-22, 25-13. Vietnam wins the match through three straight sets! 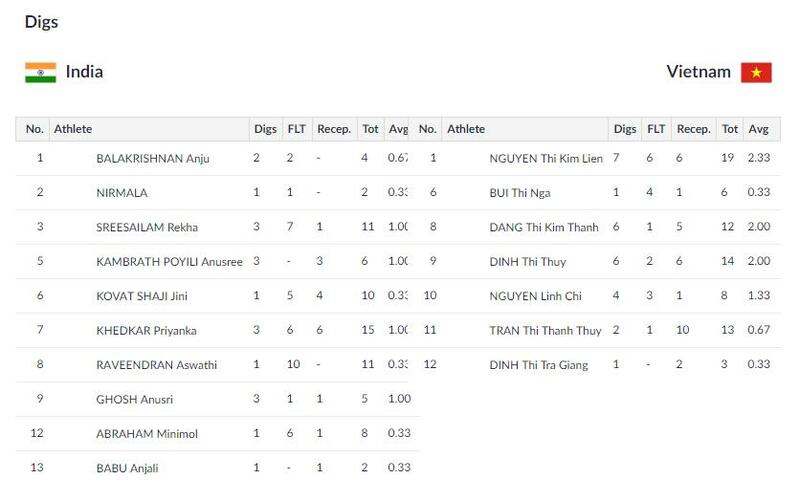 A dominating spell of play from the Vietnamese to win 25-18, 25-22, 25-13 and win the match in just over an hour of play. A hat-trick of points for the Vietnamese seals the deal! Vietnam win the set 25-13! Vietnam now surging towards victory, two more points to their credit. Vietnam 22 - 12 India. The Vietnamese have now entered the 20s, while India look to make a comeback. Vietnam 20 - 12 India. Vietnam slowly running towards to yet another set win. Vietnam 18 - 9 India. Jini Shaji's dig is in vain, Vietnam with a point. Vietnam 16 - 7 India. Spike from Soorya! India accumulating points now. Vietnam 15 - 7 India. A team fault from the Indians gift-wraps a point to the Vietnamese. Vietnam 15 - 6 India. Rekha Sreesailam continues her good run with a spike to bring home a point. Vietnam 13 - 5 India. A point each to both teams but Vietnam still firmly in the lead. Vietnam 12 - 4 India. A fault serve from the Vietnamese as India claims a point. Vietnam 10 - 3 India. The leaders strike back now with two more points to their credit. Vietnam 8 - 2 India. Two points in a row for India as the spikes are doing them a whole world of good. Vietnam 6 - 2 India. The Indian eves' reception faltering as the Vietnamese pick two points in a row. Vietnam 6 - 1 India. Anju Balakrishnan drives home India's first point of the set with a pacy spike! Vietnam lead 4 - 1. Vietnam clearly in the drivers' seat as they lead 4-0. The third set has commenced! Vietnam win the second set 25-22! A dominant show from them but some credit must go to the Indians for keeping the deficit down to just three points. Wow! Indians not giving up for sure as they pick two more points. Vietnam 24 - 22 India. India make a break into the 20s and are closing in to the Vietnamese' score. Vietnam 24 - 20 India. Three more points to Vietnam's credit as they now stand only two points away from set victory. One more point to Vietnam as they enter the 20s. Four points in a row now for India, as the eves seem to be gaining the lost ground. 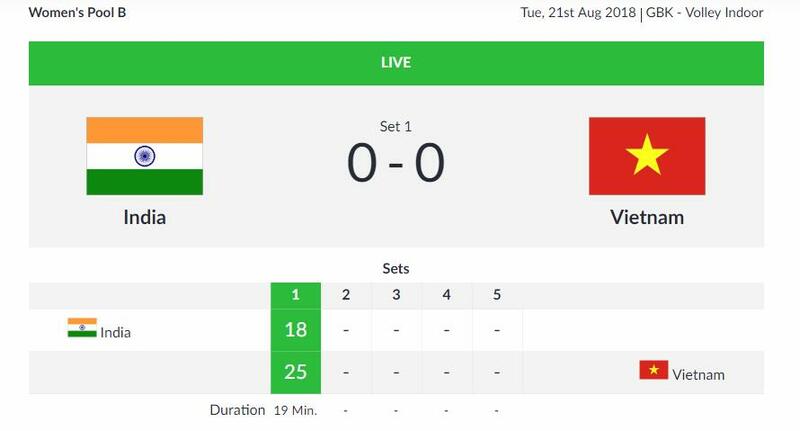 A point after long for India as Jini Shaji's serve is too hot to collect for the Vietnamese. The Vietnamese going strong as they pick two more points to swell the lead. Vietnam 17 - 8 India. Anusri Ghosh's serve is met by a ferocious spike, which cannot be blocked by the Indians. Vietnam lead 15 - 8. Sreesailam's serve goes wide as the Vietnamese collect yet another point. Vietnam 12 - 7 India. Soorya's spike brings the serve to the Indian half. Vietnam 9 - 6 India. Vietnam running away with the lead as the score reads 8-5. Abraham's spike gives India another important point. Vietnam 6 - 4 India. India's dig goes wrong and the Vietnamese now have a hat-trick of points to get back with the lead. Vietnam 6 - 3 India, 2nd set. Sreesailam puts in a valiant block as the Indians level score in the second set. Vietnam 3 - 3 India. First point of the second set for India as Vietnam's spike goes wrong. Vietnam 3 - 1 India. Two more points to that total as the Vietnamese are doing well to retain serve. Vietnam 3 - 0 India, 2nd set. A positive start for Vietnam in the second set as they take a 1-0 lead. Minute-by-minute updates will be available now! Apologies for the delay in coverage! There were some technical snags. Hello and Welcome to Sportskeeda's coverage of the Asian Games! Next up is the Women's Volleyball match against Vietnam! The eighteenth edition of the pan-Asian games come to us from Indonesian cities of Jakarta and Palembang, where over five hundred and fifty Indian sportspersons will try to win medals for the country. Day Two of the Asian Games was action-packed as India won a few medals. There was also progress on other fronts. Vinesh Phogat won the Gold medal in Women's wrestling, while Deepak Kumar and Lakshay won the Silver in Shooting. As a result, after Day Two, India has a total of Five medals in their account. There was progress elsewhere, as the six out of seven Indian representations made it through to the next round in tennis. Volleyball action continues on Day 3. Catch the Women's Tournament Preliminary Pool B - India vs Vietnam - Match updates on Sportskeeda!